I wonder if it’s possible to brainwash a child? It’s operation “get-toddler-excited-for-football-season” in this house. I’m not sure if it will work, but we’re hoping our experiment will prove successful. Because football is everything. Ok maybe not everything – football grub is everything. 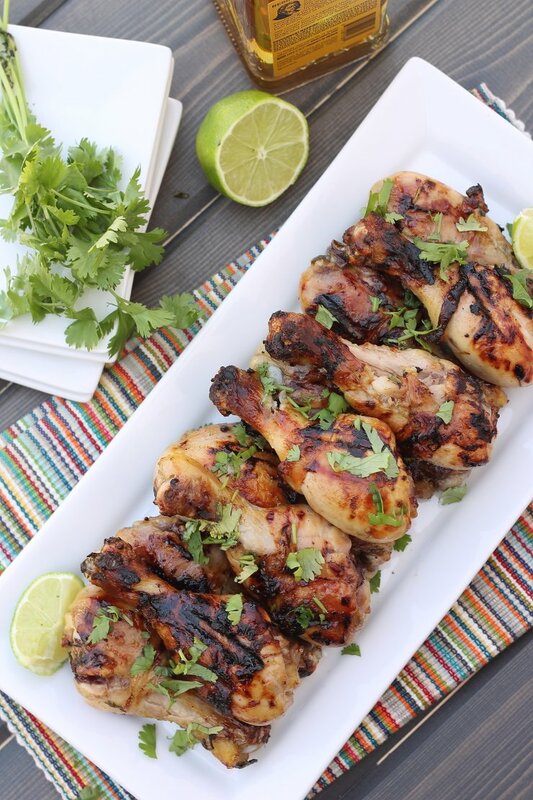 As are these honey tequila lime chicken drummies. Yeah we are crazy football people. I’m not afraid to admit it. When the sound of Carrie floods the house and Al Michaels’ voice gives you goosebumps, you know it’s going to be a good day. FACT – my husband and I are so crazy about this sport that we “gifted” NFL Sunday Ticket to each other for an early Christmas gift. It’s unconventional, but it’s us. Naturally we want need our children to love the game like we do. We’ve been hyping it up all summer to our toddler – football this and football that. “Buddy, can you say touchdown? !” “Should we watch some fooooootball?!? !” “Say YAAAAAY Go Pack Go!” (that last one is all me, since my hubby is a Vikings fan – bleh). We need to brainwash this kid to enjoy Sundays of game-watching, because when kickoff happens we simply can’t be bothered. The only excuse to pause a game is of course, for the snack breaks. Football snacks are unlike any other snacks, they’re are in a league of their own. Cheesy, greasy, carby, hearty. Yup that sums it up. Amidst all the tempting junk food and naughty temptation, there are these honey tequila lime chicken drummies. All the football snacking pleasure without the insane caloric gut bomb. 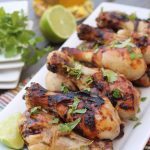 Just picture this – sinking your teeth into these tender chicken drumsticks, with the bold flavors of tequila and lime marinated into the meat, then finished with sweet honey glaze. It will make anyone want to break out their finest touchdown celebratory dance. And these are sooooo simple to make. Just marinate the chicken overnight, throw on the grill, brush with honey and wham bam thank you ma’am you’ve got yourself a WINNING football snack or main dish the whole team will love. It took all the willpower in the world not to want to chug that sweet smellin’ lime/tequila marinade (it smells like a margarita). Maybe it’s because I have a toddler and a newborn and my need for alcohol seems dire right now. BUT I didn’t drink it – I let these chicken dummies have all the fun while I pretended my ice water had magic powers to energize my sleep-deprived state. What’s your favorite game-watching snack? That is total football food! My husband and son would love this dish! Totes!! My 23-month-old even devoured them up! Oh my goodness, my family would love these! Looks amazing! 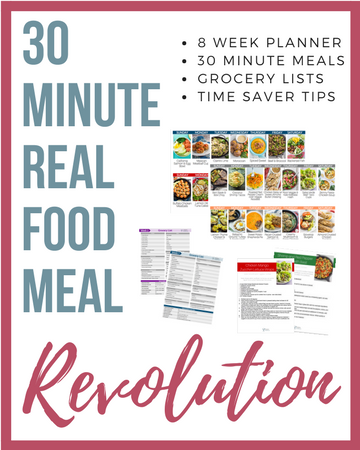 I’m going to try this for sure and add it to my meal plans! Love that idea Jehava! Enjoy! This sounds amazing! Great for Labor Day weekend!! Oh my gosh these look amazing! I think the only thing I would do differently is do them with chicken breasts, as my husband prefers chicken that’s not bone-in. Though I think it will change the flavor a bit so maybe I can convince him not to do that lol. Hi Elizabeth! As long as you marinate them long enough, I bet you could totally replicate them with chicken breasts. You may need to decrease the grill time depending on the thickness of the meat though. I hope you are your hubby love ’em! i really want some of those now. they sound amazing and you had me at TEQUILA! It does! I love adding it to chicken tacos too! Omg this looks so delicious. It makes me sad that summer is ending. It went so quick. Great recipe! These pictures are so incredible! I feel like I can pick these wings up through my computer and taste them! We are working on that same brain washing over at our house 😉 Good luck to you! This looks really delicious. I’m always looking for new recipes and I think I will try this next weekend. Awesome! Thanks so much Tiffany. I hope you DO give these a whirl! Oh damnnnnn girl! 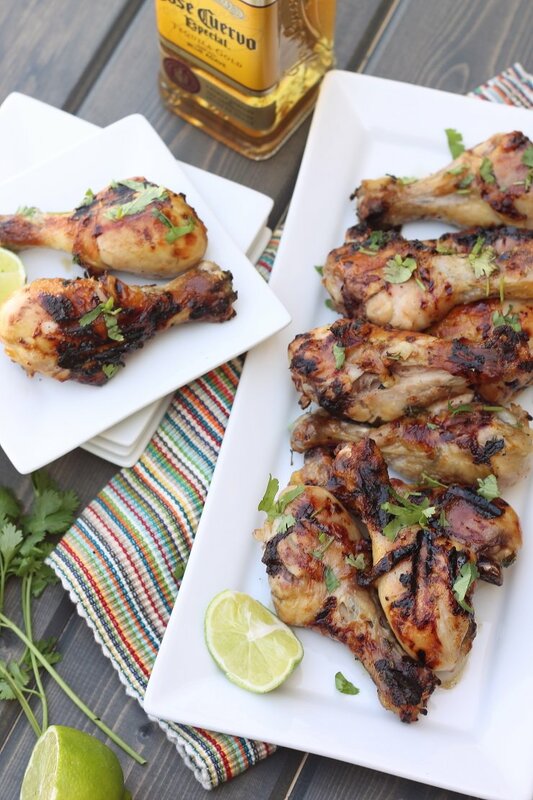 I LOVE chicken drummies, and adding tequila to the marinate? Whew this one’s going to be a popular one at the table! Omg this looks so delicious! I need to try this at home. Thanks for sharing! YESSSS you so do! Thanks for stopping by Tuyet! Don’t drool on your keyboard Angela! Hope you love them. Thanks for the pin love Angela! Enjoy friend! Oh my goodness, this looks so delicious. I can’t wait to give this a try. I hope you do! They are pretty dang yummy! These look so good. My kids aren’t good with drumsticks, though. Should work with chicken breasts, too, yes? Yep! Totally could do these with chicken breasts, although the grilling time may be lessened a bit, depending on the thickness of the breasts. I hope your kiddos love this Tara! Agreed! I love honey on chicken and roasted carrots. Just gives a nice finish! Thanks Erin! I hope you do! Definitely a crowd pleaser! These sound SO dang delish!!! My fiance and I are all about a good drummie recipe (we had them grilled with BBQ for the holiday! ), so I’ll be whipping these up this week or next for us! Lovelovelove the touch of tequila! Oh I’m so glad Erica! You guys are drummie experts – so you’ll rock this recipe! These look delicious! Definitely pinning this recipe to make for a football game soon! Thanks so much Lecy! Love the pin love! I am drooling over this recipe! I can’t wait to try this combination of flavors. Yowza! Thanks for sharing! Thanks so much Aarika! The combo is pretty awesome if I do say so myself. This looks utterly and completely amazing! YUM! Thanks Angie. Yes, utterly YUM is sooooo true. Yum! Such an amazing combination! And I’m with you…Go Pack Go!!! 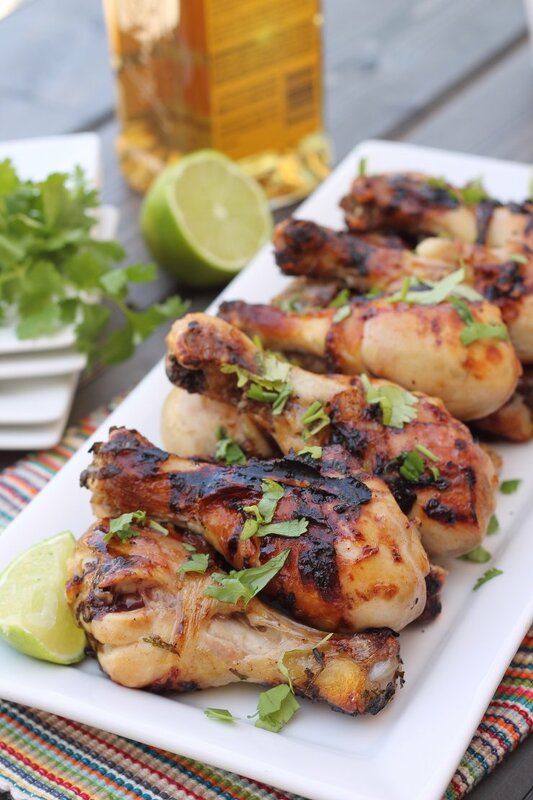 I am also a crazy football person lol This looks super yummy.. Chicken, lime and tequila….yes please. FIST PUMP ya girl. I love a fellow female football fanatic!! Enjoy Dia. My husband would love these! Definitely going to make them for a game day! I, Tamara, have never made drummies. I just might have to after reading this. These look amazing! I’m always looking for recipes to liven up chicken, I’ve pinned it for later. Pin, make, devour! 😉 Thanks Alison! WOW. I know what I’m making on Sunday! You don’t have to love football to enjoy football grub. I mean, the food is the best part! 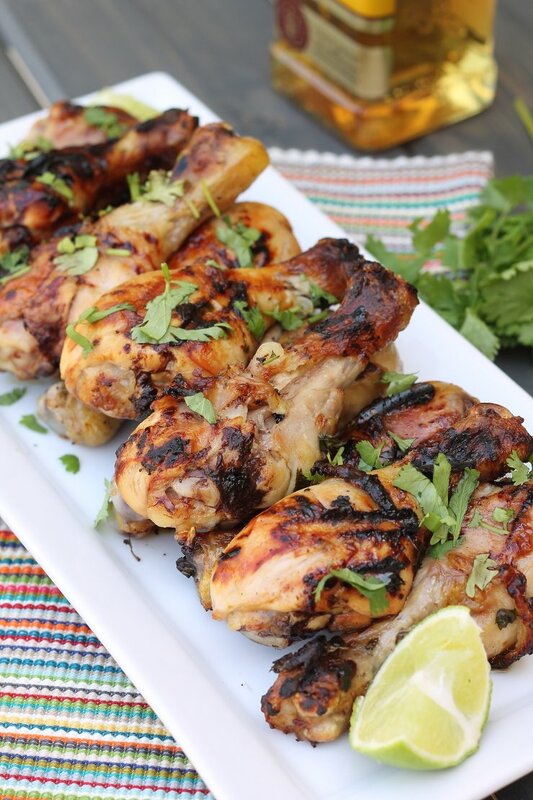 These chicken drummies look really good, thank you for sharing this recipe! 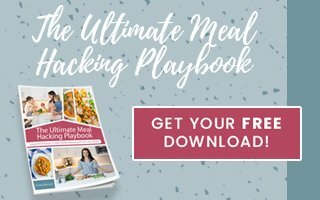 I love trying new recipes that I know my family will love! You’re so welcome Ashleigh. It’s a family favorite here! First off, we are those Football crazies :)! Secondly, These look Ah-mazing! 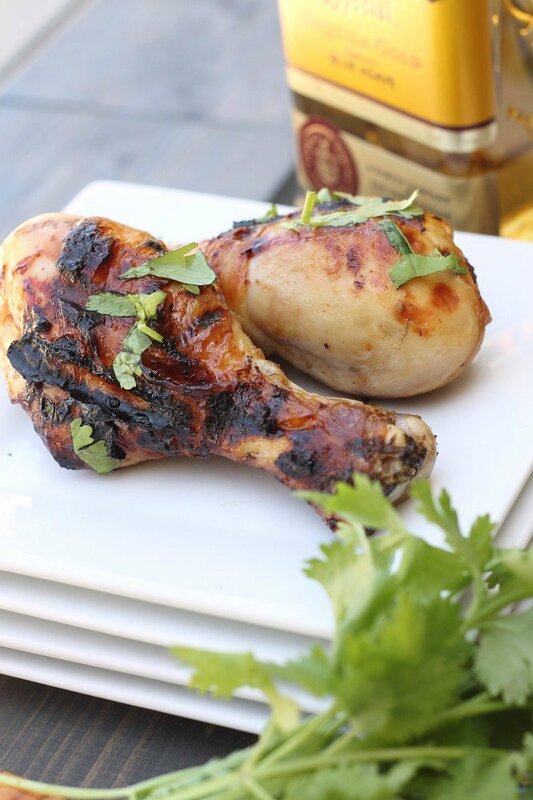 We love chicken so this recipe is perfect…giving a different flavor to one of our favorite meats! YAY a family after my own heart!!!! I hope you love these Natasha. Sure to get the kids all messy but hey, that’s what weekend are for, right? !